Novak Djokovic ended a career-long jinx, lifting the trophy in Cincinnati at last to complete a matched set of Masters 1000 titles. 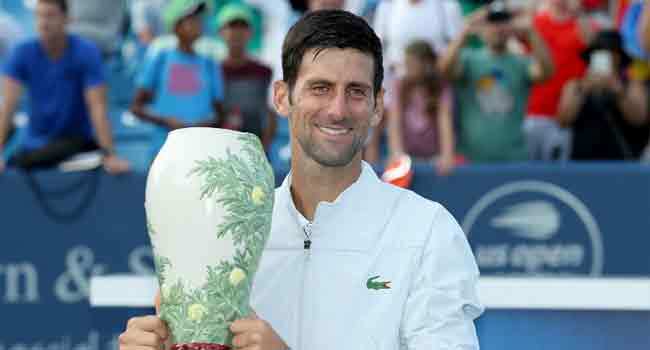 Djokovic, who came up empty in five prior Cincinnati finals, defeated seven-time winner Roger Federer 6-4, 6-4 in the final. Federer, a 20-time Grand Slam winner, said his game wasn’t sharp — but he didn’t want to take anything away from Djokovic’s achievement. Federer’s streak of 100 straight unbroken service games in Cincy was ended by Djokovic in the seventh game of the first set. The 37-year-old Swiss had been aiming for a 99th career trophy, but was unable to get over the line due in part to four double-faults at the most inopportune of times, but he said his return game was also lacking. “It was definitely not my best day on the return – it was just awful,” Federer said. “Missing every second serve on the forehand side, I don’t know what that was about. “But I don’t even want to look for reasons why it happened,” he added. “Novak totally deserved to win today. This (effort) was not good enough. “Good week, but I’m happy it’s over and I need to rest,” added Federer, his eye on the US Open starting in New York in eight days. Djokovic claimed the opening set in 37 minutes and came back from an early break in the second to overhaul his longtime rival as they played for the 46th time. The Serb now leads Federer 24-22 and has won their last three encounters. The pair had not played since the 2016 Australian Open semi-finals more than two and a half years ago. Wimbledon champion Djokovic claimed his Masters record on his first match point and now heads to the US Open as a title favorite after a string of sub-par seasons and an elbow injury which required surgery. “It’s a wonderful feeling. it’s been a couple of tough months for me with an injury and then winning Wimbledon and Cincinnati,” Djokovic said. Federer started the match with three aces in the opening game, then added a pair of love games for a 3-2 lead. But it began to unravel as the Swiss double-faulted to yield a breakpoint, dropping serve as Djokovic moved ahead 4-3. Djokovic took advantage for a 5-3 lead and closed out the set after 37 minutes. Federer broke for a 2-0 lead in the second set but gave the break back immediately as he double-faulted to give Djokovic a break point which the Serb promptly converted. Djokovic broke again to lead 4-3, and after Federer held to close the gap to 4-5 Djokovic ended the afternoon in the next game on his first match point.